It is a universal desire for all working adults that their increment in wages is able to beat the rate of inflation. When friends gather around for a sumptuous meal. The inevitable topic of how things are getting more expensive and are outpacing Their meagre salary increment generally becomes a little passionate. The reality for many of us is that wage increase is crawling behind the rate of inflation. What can be done to stretch our dollar a little further? Perhaps the timeless value of gold performing the role as a currency is able to partially solve one of lives many problems – the issue of our dollar losing value. In the above graph, I have taken data from onlygold.com and converted it into the graph (blue line). The values shown are the price of gold in USD on every 31th December, from 1943 to 2015. 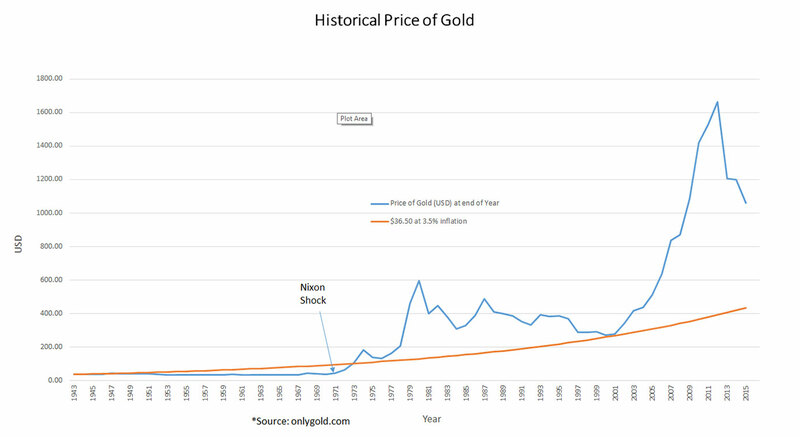 From 1944 to 1971, the price of gold was relatively stable at between $35.15 to $44.60. However, the “Nixon Shock” of 1971 changed all this stability. Essentially, President Richard Nixon had removed the convertibility of gold to the dollar and the net result of this was basically the free floating of global currencies. In 31 Dec 1972 and Dec 2012, the price of gold was $63.84 and $1664 respectively, a multiple of 26 times in the span of 40 years! The propulsion of gold price to an all-time high of $1908 in the month of August 2011 was an accumulation of the sub-prime crisis and Lehman Brothers collapse leading to the great recession between 2008 to 2009. Seven years later in 2016, this systemic risk of similar magnitude seems to be still lurking. Singapore, the average annual rate of inflation has been 2.68% from 1962 to 2016. Therefore, using the rate of 3.5% would have given it an unfair advantage over the price of gold! Yet gold price is still shown to be resilient even using 3.5% as an arbitral average annual inflation rate.